Wed, Jan 23, 2019, 09:26 pm SL Time, ColomboPage News Desk, Sri Lanka. 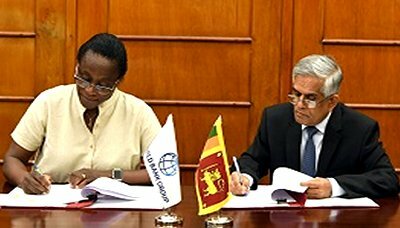 Jan 23, Colombo: Sri Lanka will get USD 200 million from the International Bank for Reconstruction and Development (IBRD) of the World Bank to implement a project to strengthen the country's primary health care system, the Finance Ministry said. The financing agreement of the Primary Health Care System Strengthening Project was signed by Dr. R H S Samaratunga, Secretary, Ministry of Finance and Mass Media on behalf of the Government of Sri Lanka and Ms. Idah Z Pswarayi-Riddihough, World Bank Country Director for Sri Lanka and Maldives on behalf of the World Bank on January 23, 2019 at the Ministry of Finance and Mass Media. According to a Ministry statement, the development objective of the proposed Project is to "increase the utilization and quality of primary health care services, with an emphasis on detection and management of non-communicable diseases in high-risk population groups, in selected areas of the country." This objective will be achieved by supporting the reorganization and strengthening of the Sri Lankan primary health care system. Specifically, the project will support the development and roll out of policies and standards and strengthening of various supportive systems. The project will lay the foundation for a more integrated, coordinated, and people-centered delivery system. The primary beneficiaries of the project will be the users of public Primary Health Care (PHC) Institutions in the selected communities of the country. The primary users of the public PHC Institutions tend to be the poorer segments of the population. Within the communities supported by the project, those who are most at risk of having or developing a severe or catastrophic Non-communicable Disease (NCD) will be the primary target. Project interventions will benefit the health sector staff at the central and provincial levels by strengthening their capacities and making resources available to plan and execute the strategy for strengthening PHC services. A Project Steering Committee (PSC) will be established and co-chaired by the secretaries of the Ministry of Health, Nutrition and Indigenous Medicine and Ministry of Internal and Home Affairs and Provincial Councils and Local Governments.